According to sources with access to NFLPA salary data, Keenum would make an extra $250,000 if he plays 85 percent or more of the Vikings’ offensive plays this season. 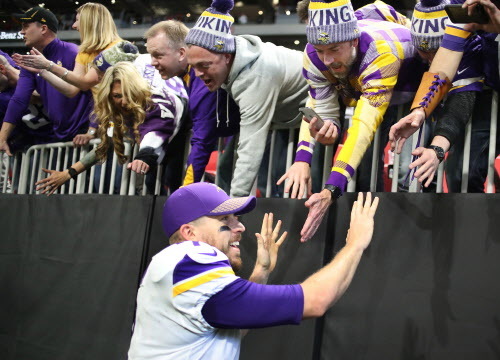 Vikings quarterback Case Keenum, who’s been one of the surprise stories of the 2017 NFL season, will be a free agent in March and is in line for a significant raise next year because of how he’s played while leading the Vikings to a NFC North title. The fact Keenum has been the Vikings’ starting quarterback for most of this season has him set to earn a little extra money this year, too. According to sources with access to NFLPA salary data, Keenum would make an extra $250,000 if he plays 85 percent or more of the Vikings’ offensive plays this season. Keenum, who’s played 90.4 percent of the team’s offensive snaps this year, would hit the bonus if he starts on Sunday. He’d earn $150,000 if he plays 75 percent of the Vikings’ offensive snaps, but with the team still trying to secure a first-round bye against the Chicago Bears on Sunday, Keenum figures to play. He’d also add to a per-game roster bonus that pays him $46,875 each time he’s on the 46-man active roster on game day. Keenum has been active for every game this season, and would maximize his roster bonus at $750,000 if he’s active on Sunday. If he starts and plays most of the Vikings’ snaps, his bonuses and incentives for the season would total $1 million, in addition to $950,000 base salary, $250,000 signing bonus and $50,000 workout bonus. That’d give Keenum a total of $2.25 million for the season. In any case, he’s going to end the year as a major bargain for the Vikings. But as the team turned to him, it also gave the quarterback a chance to earn a little extra cash. Here’s a look at several other Vikings players who have a shot at incentives and roster bonuses in the regular-season finale. G Joe Berger: Can earn an extra $900,000 if he plays 90 percent of the Vikings’ offensive snaps (Berger has missed just two snaps all season). Berger can also cap out his per-game roster bonus at a total of $250,000 by being on the active roster for the 16th time this season on Sunday. WR Michael Floyd: Can make another $15,625 in per-game roster bonuses on Sunday, bringing his season total to $171,875 by being active for his 11th game. LB Emmanuel Lamur: Can make another $15,625 in per-game roster bonuses on Sunday, bringing his season total to $250,000 by being active for his 16th game. LS Kevin McDermott: Will likely end the season with per-game roster bonuses of $23,437.50, given the fact he’s expected to miss Sunday’s game with a dislocated left shoulder. RB Latavius Murray: Can reach a $500,000 incentive, as well as a $500,000 salary escalator for 2018, by rushing for 169 yards on Sunday and finishing with 900 yards for the season. Can earn another $46,875 in per-game roster bonuses on Sunday, bringing his season to tal to $750,000 by being active for his 16th game. CB Terence Newman: Can make another $15,625 in per-game roster bonuses on Sunday, bringing his season total to $250,000 by being active for his 16th game. Newman, who’s played 56 percent of the Vikings’ defensive snaps this season, is likely to fall short of a $150,000 incentive for playing 65 percent of the Vikings’ defensive plays. TE Kyle Rudolph: Can make another $15,625 in per-game roster bonuses on Sunday, bringing his season total to $250,000 by being active for his 16th game. Rudolph, who has 56 catches this season, won’t hit a $375,000 salary escalator for 2018 by reaching 80 catches this year, but already triggered one for next season by catching 83 passes last year. PR Marcus Sherels: Can earn a $100,000 incentive if he finishes the regular season as the NFL leader in punt return average. Sherels, who is currently sixth in the league with an average of 10 yards per punt, would need a prolific day to vault up the standings; the Lions’ Jamal Agnew currently leads the league with a 16.0 average. S Harrison Smith: Can make another $15,625 in per-game roster bonuses on Sunday, bringing his season total to $250,000 by being active for his 16th game. WR Adam Thielen: Can earn a $1 million salary escalator for 2018 by catching five passes on Sunday, bringing his season total to 90 catches. Thielen has already secured a $750,000 salary escalator for next year by reaching 80 catches. WR Jarius Wright: Can make another $93,750 in per-game roster bonuses on Sunday, bringing his season total to $1.5 million by being on the 53-man roster for his 16th game. Wright restructured his deal with the Vikings before the season, taking a $1.05 million base salary instead of the $2.5 million he was scheduled to receive and converting $1.5 million to per-game bonuses. The restructuring came just before roster cuts at the end of the preseason. Wright caught just 11 passes last season; with rookies Rodney Adams and Stacy Coley on the team’s initial 53-man roster, and Floyd set to join the team in October after a four-game suspension, the Vikings clearly wanted to retain some flexibility with the 28-year-old. The team wasn’t in a tight cap situation, and players don’t usually agree to convert base salaries to week-to-week bonuses unless they believe they’re at risk of not earning the money at all. But Adams eventually wound up on the practice squad; Coley has played 27 snaps this season, and Floyd has caught only 10 passes for 78 yards. Wright has 18 catches for 178 yards and a pair of touchdowns. He could have to fight to stick around again in 2018, when his base salary is scheduled to jump back to $3.6 million, but he’s handled his role without griping and continued to prove his value.